This letter was not part of the early Unicode versions, which is why Ţ (T-cedilla, available from version 1.1.0, June 1993) is often used in digital texts in Romanian. T-comma was introduced only in Unicode 3.0.0 (September 1999) at the request of the Romanian national standardization body, but many computers today still do not have fonts compatible with it; computers with Microsoft operating systems older than Windows XP do not have compatible fonts. Windows XP's default fonts do not support this letter out of the box, but it is possible to install the European Union Expansion Font Update, which adds support for this letter. That is why many Romanian texts still use T-cedilla (or even T), despite the recommendation to migrate from cedilla to comma. Full support of this letter has been available on Macintosh computer since Mac OS X and on PC since Windows Vista. The letter is placed in Unicode in the Latin Extended-B range, under "Additions for Romanian", as the "Latin capital letter T with comma below" (U+021A) and "Latin small letter t with comma below" (U+021B). In HTML these can be encoded by &#x021a; and &#x021b;, respectively.  Appearance of comma (upper row) and cedilla (lower row) in the Times New Roman font. In Windows XP, most of the fonts including the Arial Unicode MS render T-cedilla as T-comma because T-cedilla was not believed to be used in any language. (It is in fact used, but in very few languages. T with Cedilla exists as part of the General Alphabet of Cameroon Languages, in some Gagauz orthographies, in the Kabyle dialect of the Berber language, and possibly elsewhere.) Technically, this is incorrect as a mismatching glyph is associated with a certain character code. Therefore, text written using S-cedilla and T-cedilla can often be seen as if it had been written using S-comma and T-comma. However, in order to correctly encode and render both S-comma and T-comma, one has to install the European Union Expansion Font Update. There is no official way to add keyboard support for these characters. In order to type them, one has to either install 3rd party keyboards, or use the Character Map. The Windows version of the Firefox web browser is able to generate S-comma and T-comma,[how?] even if the characters are missing from the system's fonts. Internet Explorer does not have this capability. All Linux distributions are able to correctly render S-comma and T-comma, since at least 2005. If these characters are missing from a certain font, they will be substituted with the glyph from another font. Although the X.Org Server supports the correct keyboard (ro comma) since at least 2005, selecting this keyboard from the user interface (e.g. GNOME Keyboard Properties) has only recently been made possible. ^ Marinella Lörinczi Angioni, "Coscienza nazionale romanza e ortografia: il romeno tra alfabeto cirillico e alfabeto latino ", La Ricerca Folklorica, No. 5, La scrittura: funzioni e ideologie. (Apr., 1982), pp. 75–85. This page was last edited on 26 August 2018, at 12:08 (UTC).